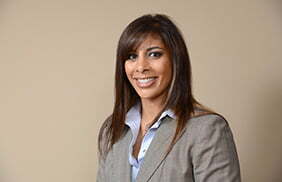 Shobita C. DuBois joined Love, Fleming & Bearsch, LLC in October, 2008, as Managing Attorney of the firm’s Business Group. Ms. DuBois focuses her practice on business transactions, intellectual property, commercial and residential real estate and estate planning. Prior to joining LF&B, Ms. DuBois worked as an associate attorney with a downtown Baltimore law firm concentrating in estate planning, business, corporate and real estate law. Ms. DuBois began her legal career as a Judicial Law Clerk for The Honorable Stephen M. Waldron of the Circuit Court for Harford County, and then as an associate at a local mid-size law firm for several years. Ms. DuBois graduated from the University of Maryland at College Park in 1995, and received her law degree from The Catholic University of America, Columbus School of Law in 1999. Ms. DuBois was admitted to the Maryland Bar in December, 1999. Ms. DuBois is a co-author of “Statutory Requirements in Residential Real Estate Transactions,” Fourth Edition, 2005, Maryland Institute for Continuing Professional Education of Lawyers, and co-author of “Hiring Considerations, Employee vs. Independent Contractor,” May/June, 2007, Mid-Atlantic Builder. Ms. DuBois is also a regular speaker at local churches and nonprofits on various topics, including estate planning and business practices. Ms. DuBois is involved in a number of professional and civic organizations, including the Maryland Bar Association, Harford County Bar Association and Member of the Baltimore Estate Planning Council. Ms. DuBois has served on the Board of Directors for The Arc Northern Chesapeake Region for two years, and currently serves as a Board Member and Vice Chair of The Arc Foundation Board. In addition to her Board responsibilities, Ms. DuBois is Chair of the Planned Giving Committee for The Arc. Ms. DuBois serves as one of the founding Board Members of Making a Difference: Truancy Education, Inc., a local nonprofit dedicated to reducing the truancy rates in the State of Maryland. In furtherance of Ms. DuBois’ commitment to the community, she is a Member of the Chesapeake Professional Women’s Network and Top of the Bay Women’s Networking Group, both of which are designed to empower professional women and women business owners. Ms. DuBois has resided in Harford County, Maryland since 2002. She and her husband have three children, who are all active in local sports.